Not all spider silk is created equal. Some spiders spin webs of wet, sticky silk. 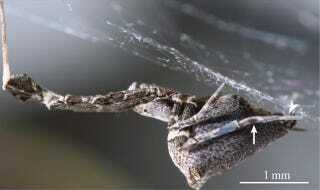 Others like the Uloborus spider have fluffy webs made of nanoscale filaments. But those fluffy webs are just as good at catching prey, likely thanks to their electrostatic charge. In order to endow the fibers with an electrostatic charge, the spider pulls them over a comblike plate located on its hind legs. (This also gives the thread its wool-like appearance.) The technique is not unlike the so-called hackling of flax stems over a metal brush in order to soften and prepare them for thread-spinning, but in the spider's case it also gives them a charge. The electrostatic fibers are thought to attract prey to the web in the same way a towel pulled from the dryer is able to attract stray socks.